Does Casper Secure Drive Backup suppot Windows 8? Yes. Casper Secure Drive Backup can be used on all versions of Windows 8. Does Casper Secure Drive Backup suppot Windows 7? Yes. 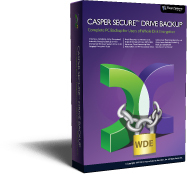 Casper Secure Drive Backup can be used on all versions of Windows 7. Does Casper Secure Drive Backup work with Solid State Drives (SSD)? Yes. Casper Secure Drive Backup has complete support for solid state and Advanced Format (4KB sector size) devices. Does Casper Secure Drive Backup work with Advanced Format Drives (AFD)? While Casper Secure Drive Backup has complete support for cloning and imaging Advanced Format Drives (4KB sector size) devices with or without 512-byte sector emulation (512e), Casper Secure does not currently support creating or mounting image file backups located on AFD devices reporting a native 4KB sector size. Does Casper Secure Drive Backup work with Advanced Format Drives (AFD) using 512-byte sector emulation (512e)? Yes. Casper Secure Drive Backup has complete support for cloning and imaging all Advanced Format Drives (4KB sector size) devices with or without 512-byte sector emulation (512e) enabled. Casper Secure also has complete support for creating and mounting image file backups located on AFD devices that are configured to report a 512-byte sector size. Does Casper Secure Drive Backup work with external USB and Firewire drives? Yes. Casper Secure Drive Backup is device independent. As long as the drives are recognized by Windows, Casper will support them. Does Casper Secure Drive Backup support USB 3.0? Yes. Casper Secure Drive Backup fully supports all versions of USB, including USB 3.0. Does Casper Secure Drive Backup work with eSATA drives? Yes. Casper Secure Drive Backup is device independent. Can I use Casper Secure Drive Backup to backup a drive that is not encrypted? Yes. Casper Secure Drive Backup will backup both encrypted and unencrypted drives. Does Casper Secure Drive Backup support multiple boot configurations? Yes. Casper Secure Drive Backup supports various multiple boot configurations, including multiboot Windows 8 and Windows 7, Windows 7 and Windows Vista/XP/2000 and multiboot Windows Vista and Windows XP/2000. Other multiple boot configurations are not officially supported. Does Casper Secure Drive Backup support copying of Windows Dynamic Volumes? While Casper Secure Drive Backup does support copying of Dynamic Volumes, it does not support cloning or imaging of Dynamic Disks. This means it will not allow you to copy an entire hard disk to or from a Dynamic Disk even if the Dynamic Disk is fully self-contained (e.g. defines a simple volume that is not striped, mirrored, or spanned across multiple disks). However, Casper Secure Drive Backup does support copying of dynamic volumes to other volumes and Basic Disks where possible. When copying a dynamic volume, Casper Secure Drive Backup will copy only the content of the volume. It will not copy or recreate the actual data structures to reproduce the dynamic disk(s) by which the volume is defined. Dynamic Volumes include volume sets, stripe sets, stripe sets with parity, and partitions located on disk mirror/duplex sets configured using the Windows Disk Administrator. Will I need to reactivate Windows when booting the computer from a copy created by Casper Secure Drive Backup? "...At each login, Windows checks to see that it is running on the same or similar hardware that it was activated on. If it detects that the hardware is “substantially different”, reactivation is required..."
© Copyright 1997-2019 Future Systems Solutions, Inc. All Rights Reserved.